This necklace was gifted to me by my friend, Madeline. She designed it and had it custom made. It is composed of a centre piece of ancient jade, possibly dating from the Shang dynasty (1600-1027 BC) to Zhou dynasty (1027-221 BC) There is lovely patina and veins, the result of age, on the surface of the jade. 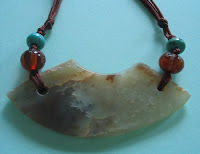 The crescent-shaped jade may have originally formed part of a Bi and may also have served as a lower-side piece in a "gentleman's ancient girdle-pendant set" The 2 perforations are conical-shaped possibly made with bamboo drills. The accompanying amber and turquoise beads are new. Strung in Chinese silk cord.